Thanks Simone! This is bad! I am so sick of people thinking Rotts are a nasty, mean, breed of dog, I own one and he is the love of my life, he is a big baby, he absolutely loves my grandkids, and all people. Stop giving them a bad name. this is messed up and just wrong. QUOTE: "The pups were given a lethal injection by animal control yesterday because the council considered rottweilers dangerous, Mr King said, despite them only being six weeks old. However, the puppies mother, which was now classed as "menacing" by the council, was given back to its owners because they paid an $80 fee, he said. 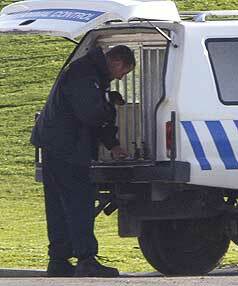 It was also the opinion of the council's animal rangers that the puppies owners were not good owners, he said." End Quote. Do these "officials" have their heads screwed on right? have they been smoking the carpeting, or what? I hear you, Eldonna. I don't have Rotties myself but I've seen lots in the dog milieu here and never felt threatened. If they come from reliable breeders, from sound-tempered parents and grandparents, if the pups are socialized right and don't have crackpot owners but responsible ones who know what their dogs require, then they are just the same (bold, underline) as any other good dog. I am getting more and more convinced that some people are taking advantage of "dangerous dog" laws to indulge to the fullest in their hatred of dogs in general! Sorry for the ranting here. Thanks Simone.